Be sure students realize that any picture (even 3-d) can be created from points and/or mathematical equations. Spend time talking about their favorite 3d movies and explain they are beginning the process. 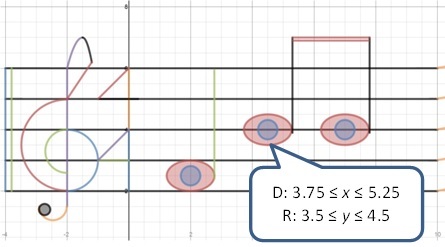 You can connect this lesson to transformations by having students think about how to animate a graph. For example, in the graph above, think about how to make Bart's eyes move. Select these links for more information and a great video about the "why" of domain, range, and functions. Choose a graph and open it. Unselect every equation so the graph is blank. Display blank graph to students. Have a student choose an equation, make a conjecture about the shape, size, and/or location of the graph, then select the equation to see if the conjecture is correct. The details a student can provide will depend on the class level. Watch video of graph being created. Select any graph. Students practice identifying domain and range for any part of the graph. Be sure to discuss how estimates are made for domain and range values as well as the types of inequality symbols used. Encourage students to consider whether the domain or range of any part of the graph might be all real numbers. To help students get started, watch screen below or download ppt to see animations.